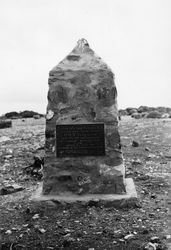 A cairn commemorates Captain Matthew Flinders and his ship`s company`s first visit for water in 1802. 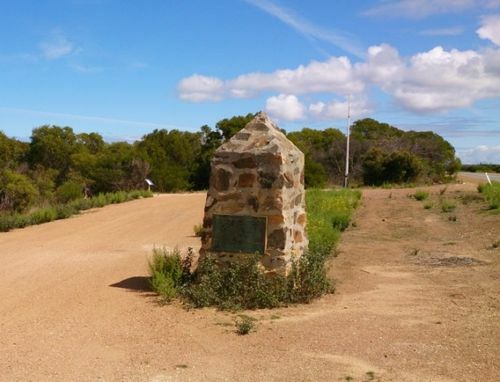 Permission has been granted the Flinders Commemoration Committee, by the District Council of Lincoln, to erect a rough cairn as a memorial to mark the spot where Capt. Matthew Flinders landed and obtained fresh water in 1802. The cairn will be erected on the roadside at the head of Proper Bay. Port Lincoln Times (SA), 25 February 1938. The unveiling of the cairn and tablet on Friday last, March ,3, was an impressive ceremony. First there was the reading by the secretary (Mr. T. Carey) of the entries which Flinders made in his journal at the date of his visit in 1802, and then followed the re-enactment of the landing and operations of the watering party. After the Reveille and hoisting of the Union Jack, the National Anthem was sung. The chairman of the Flinders Commemoration Committee (Mr. N. W.Wright) after a brief speech, in which he stated that this ceremony represented the consummation of the three chief objects of the committee, asked the Mayor (Mr. R. F. Poole) to speak. Mr. Wright paid a great tribute to the historical research work of Mr.J. D. Somerville and the help of the assistant Government Geologist (Mr. Signet) in fixing the site of Flinders' wells. The Mayor spoke of this as the first of centenary pageants and welcomed all the visitors. He said this historical spot would always be remembered by ourselves, and our descendants some of whom may be represented at the bicentenary. He then asked Mr. G. C. Morphett to unveil the tablet. Port Lincoln Times (SA), 9 March 1939. 27th February - 4th March 1802. Centenary of the town of Port Lincoln. Pres. Royal Geographical Society of Aust. (S. A. Branch) 3. 3. 39.